an old closed fabric mill in the Southern U.S. and I was able to pick them up at a flea market when no one else was interested. Shabby…and they are two, though not identical. Today I brought them in to see how they would look with the changes in the bedroom that I’ve been making. 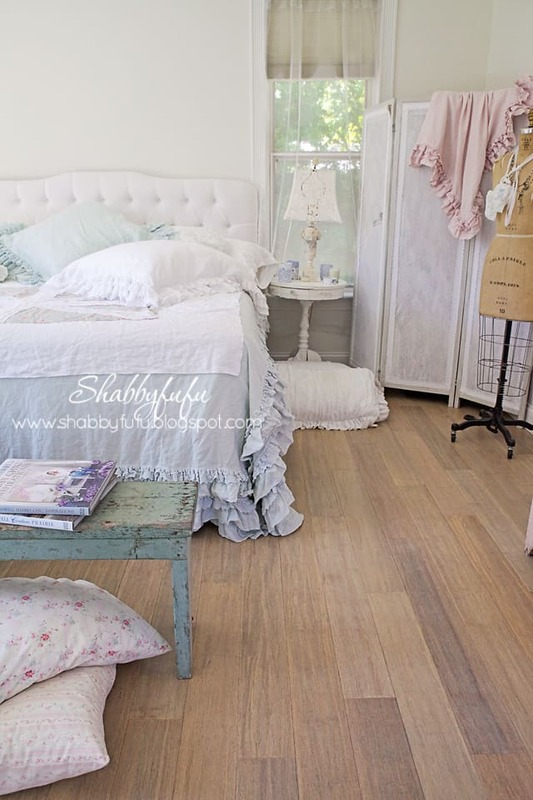 The room has good space and light, and I set them angled by the foot of the bed. 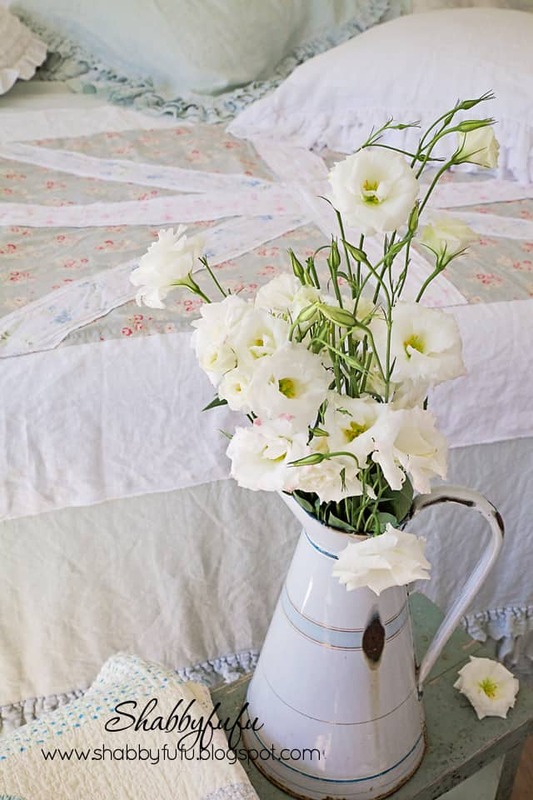 Quilts, fresh flowers and books…and some extra pillows for the pups to be comfy on the floor. They synchronize with my pastel color scheme of pale blues, yet are more of a seafoam/robin’s egg/aqua~esque mix. Full of weathered aging as they have been sitting under the covered patio and the squared nails have a bit of rust. Perfectly imperfect. 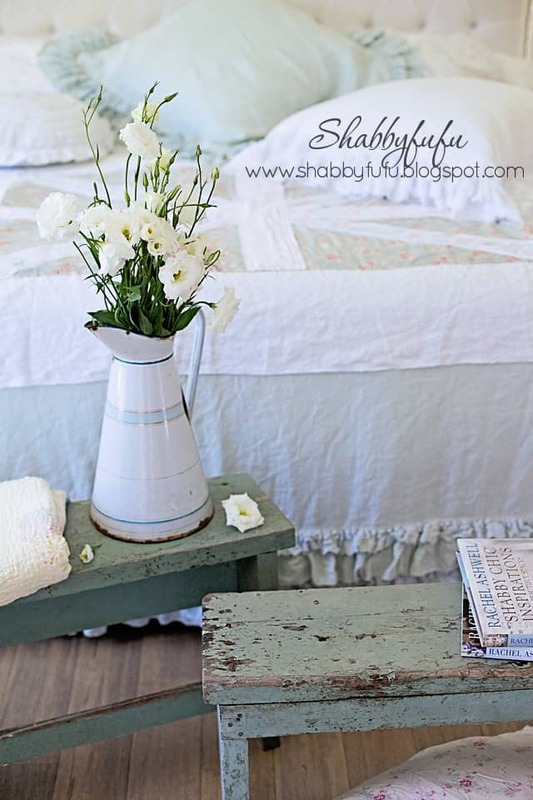 The linens are a mix of Rachel Ashwell Shabby Chic Couture and her Target line of Simply Shabby Chic…as well as some vintage and my Shanty Jack throw from Sherry Hicks. I’m often ask where I purchased the tufted headboard. It came from JC Penny around 5 years ago. I’m not sure that they would still carry it, but you can find them more easily on~line nowadays. This one is white denim which has held up amazingly well with an initial spritz of fabric protector. PS: thank you for the visiting my blog! I am new to your blog and love it. the benches are to die for. 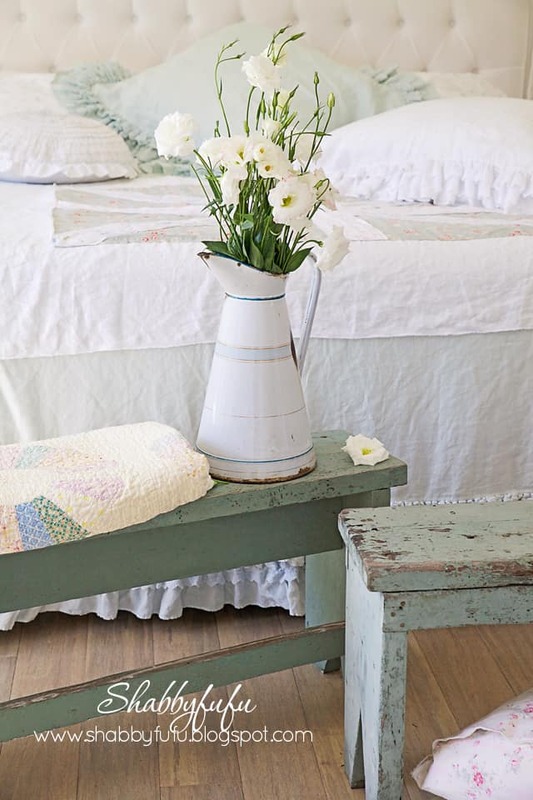 Loving the benches and am really loving the antique quilt and the french pitcher I love how you mix primitive with shabby and french I love this more rustic look it is all so pretty! 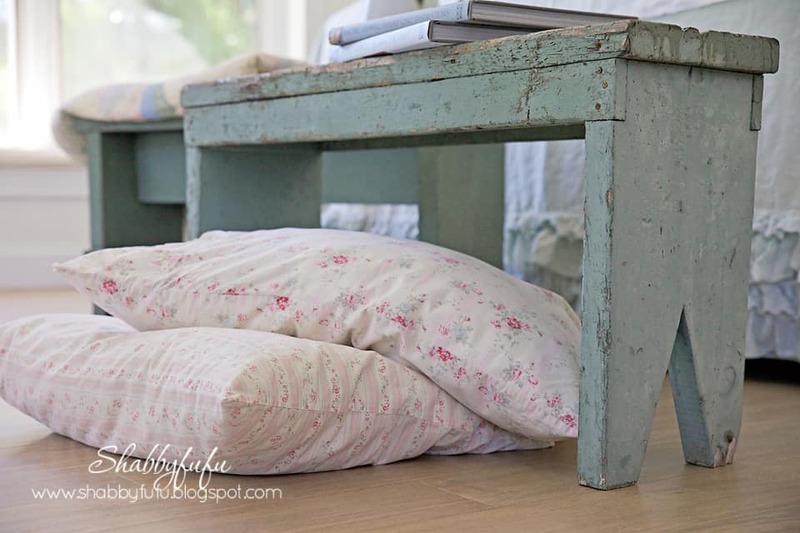 Your dogs are probably sporting the best dog beds around….. Was so fun visiting your page and seeing all the beautiful photos!! Oh it's all so pretty to look at! 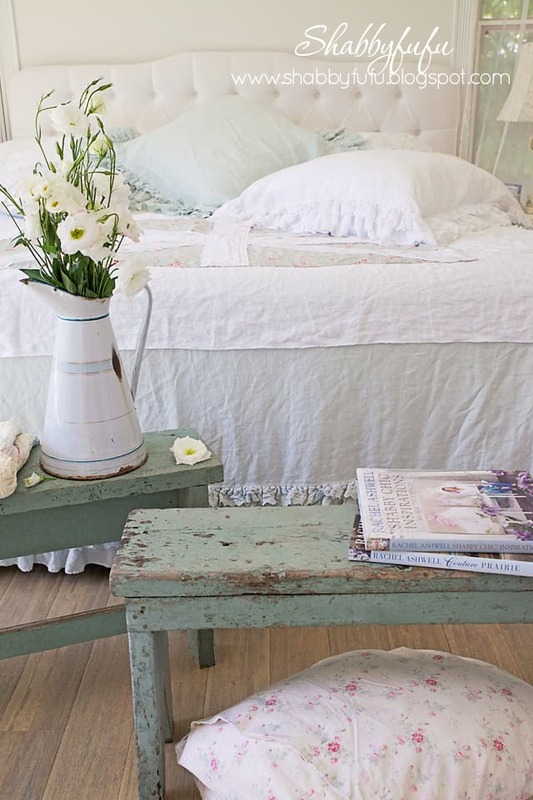 Love the linens. Love the benches! To think people were passing up those darling benches. They're wonderful!… and just perfect in your bedroom. Love that you leave pillows down for the doggies. I would have a difficult time getting out of bed in that room. Oh my, I LOVE your bedroom. Fantastic. I pinned it just now. 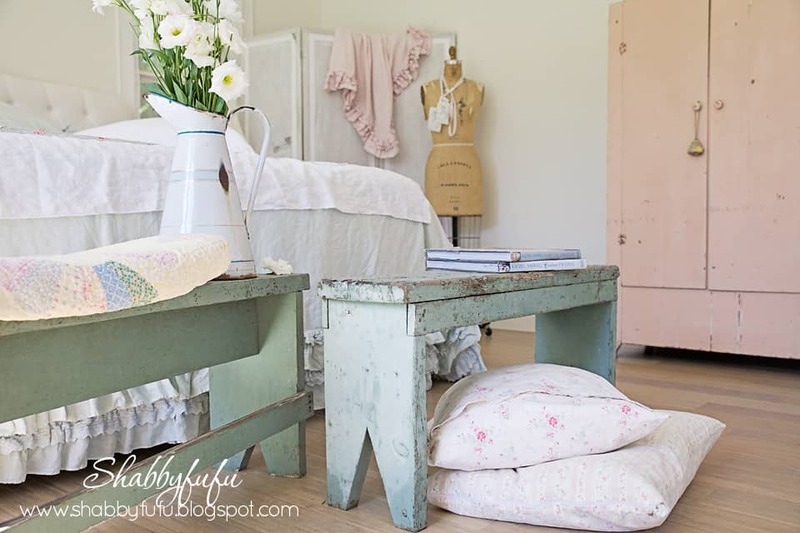 Love the pastel shades and chippiness of these benches! Perfect addition to your already beautiful room! I love those benches and how you used them. Love the headboard too. Love the colour of the benches! Your blog is amazing! Your room is beautiful!!! 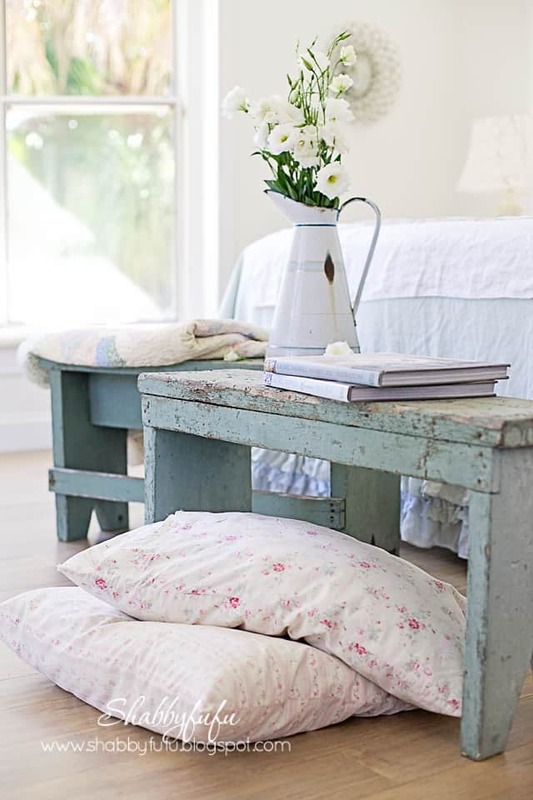 Love the benches in your room. 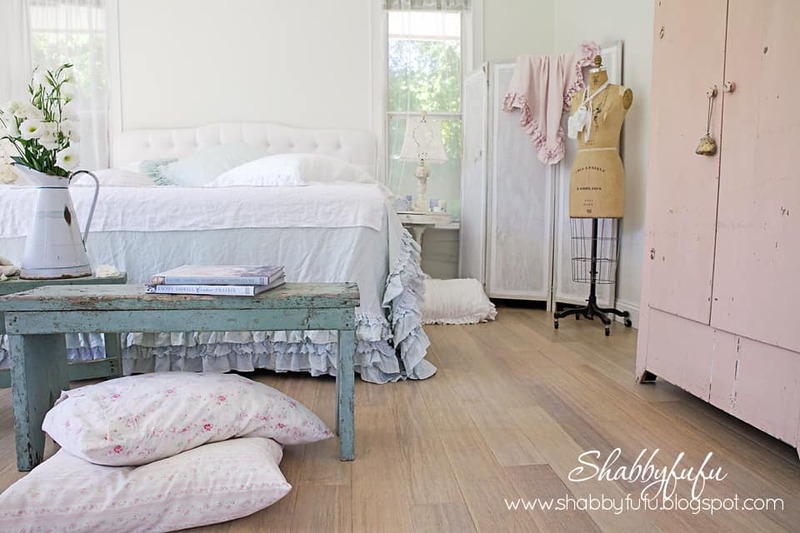 How beautiful they look with your bedroom…perfectly imperfect as you said. Those are the best! Janet,love how the room turned out! Beautiful!